Our cabins are convenient to numerous attractions, theaters, outlet shopping malls, white water rafting, the famous Arts and Crafts Community in Gatlinburg, golf courses, Ripley’s Aquarium of the Smokies, horseback riding, hiking, and Dollywood’s newest attraction, Splash Country! Serenity Falls is a peaceful, serene location for smaller, formal wedding ceremonies and celebrations. Tillie’s Stall Cabin is perfect for couples who want an intimate experience in an studio style cabin. Features include a bedroom with a queen sized bed, sitting room/kitchen combination, and a loveseat. Tillie’s Stall sleeps 2, and just like all of our cabins at Serenity Falls, it sits peacefully beside the creek. Come enjoy this quaint cabin. Will’s Barn is a 2 story building with 2 bedrooms and 2 baths for added privacy. The outside deck overlooks the creek and nearby waterfall. This unusual and rustic cabin also features a gas log fireplace, central heat and air, and full kitchen for your convenience. Sleeps 6 with one queen bed, one full bed and a queen size sleeper sofa. Ed’s Mill Cabin features a full kitchen, 2 bedrooms and full bathroom. Closest of all the cabins to the waterfall, Ed’s Mill has glorious views and large windows to ensure that you can easily enjoy them! The cabin features a deck overlooking the waterfall and central heat and air. Sleeps 6 with one queen, one full and a queen sleeper sofa. Under Construction! The General Store is currently being remodeled and will feature 3 bedrooms, 3 baths and a hot tub! Contact us for completion date and rental availability. This place was spectacular! Sue and Ken and the kids are wonderful people! They welcomed us and made us feel right at home immediately. The scenery is absolutely amazing! Most definitely will be back and will recommend to everyone! Me and Stephanie Mays needed a weekend away. I stumbled on this and fell in love. The owners are awesome and treat you like your family and matter. Beautiful setting. We will definatly be back alone and with kids. Very nice. Very restful. Wish we could've spent more time there. I'd recommend Ed's Mill to anyone. Great hospitality by Sue, Ken, kids and wonderful dogs too. Location oozes tranquility and peace. We are staying in Ed's Mill right below the waterfall which is music to the soul day and night. Surrounded by quiet woods which is ideal for walking our two small dogs. Serenity Falls is a peaceful, serene location for smaller, formal wedding ceremonies and celebrations. 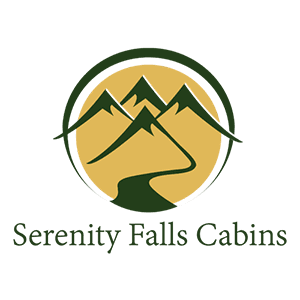 We are continuing to renovate and add to the splendor of Serenity Falls and have plans to accommodate larger outdoor ceremonies and receptions in the near future. If you are interested in booking your event, feel free to contact us for more information.